Diablo III (Diablo 3) is an action RPG experience that was long awaited by fans of the series. Launching in May 2012 with an expansion pack (Reaper of Souls) in 2014 the game continues the story of angels, demons and humans in Sanctuary. Players will choose from one of five character classes (six with the expansion pack) and adventure across Sanctuary as they uncover a plot that was put into motion years ago that would once again allow Diablo to rise to power. With all the characters and story elements being brought forward from previous games in the series you’ll want to have played the first two Diablo games for the best story experience. 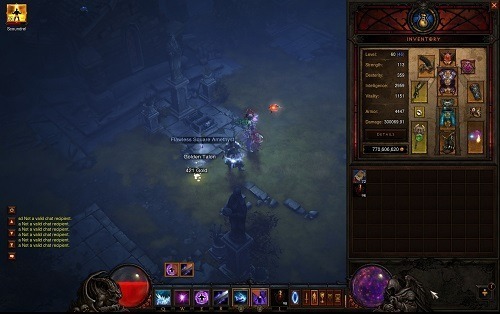 Gameplay in Diablo 3 changes up a number of elements that were staples of the previous Diablo games and action role playing games in general. The most notable of these changes is in the skill and stat systems which are designed to simplify the entire level up process. In Diablo 3 stat points are automatically assigned to your character with each level while skills and runes are unlocked slowly as you progress. Each of your skills has five runes that alter the function of the skill in a number of ways, offering up unlimited combinations for you to use in battle. For example on your Blizzard spell players can increase the duration, reduce the casting cost or improve the slowing effect. Players also gain access to a number of passive skills to take the skill system one step further in terms of depth. Diablo 3 still has the core features that made the series such a success in the first place though with randomised loot and maps still at the heart of this experience. Randomisation has even been enhanced through a number of random events that can appear while you are out adventuring. Despite these reinventions Diablo 3 started on rocky ground, requiring many patches and changes to core mechanics before much of the user base was happy with the game experience it offered. This included the shutting down of the online auction house that allowed players to easily buy and sell items to other players. As of this review the game has definitely improved dramatically and well worth playing for any action RPG fan with Diablo fans in particular in for a real treat. Return to the world of Sanctuary once more and take arms against evil. Five very different classes to choose from (six with expansion). Plenty of random areas to explore that make each game a different experience. Play with your friends online and fight off evil together. New skill and stat system lets you swap your skills whenever you want.